Wordless Wednesday is a genealogy blog theme used by many to share bits and pieces, usually photos, connected to their family history. 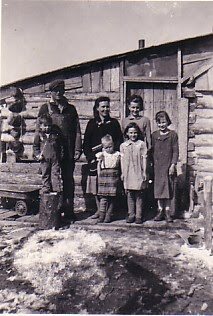 My contribution today is a photo of Andrew (Andy) Gammie Hadden, his wife Louise and their children taken in the 1920’s at their ‘home’ in Garrick, Saskatchewan, Canada. Garrick is a small hamlet about 366 kilometres (or about 230 miles) north of Regina, Saskatchewan. Andy married Louise and remained in Saskatchewan when his immediate family, which included his brother and my grandfather, moved east to Toronto, Ontario. The photo was likely taken by my great uncle, and Andy’s older brother, Alexander (Alec) Gaull Hadden during a visit. The ‘log’ home was built by Andy on land that he was homesteading. No running water, no electricity, no telephone – and it remained that way into the 1980’s when Louise was finally convinced by her children to have a phone installed for emergency purposes only!